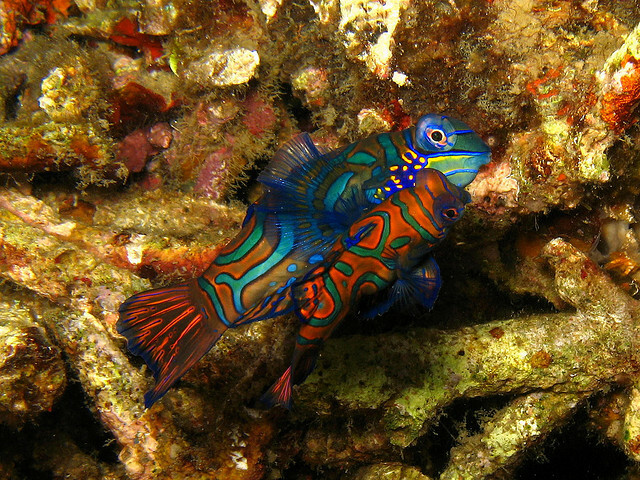 A few days ago I had my first encounter with the mandarin fish in Bunaken Marine Park. I had seen them many times in pictures, admiring their incredible brilliant colors, but knew very little about them. And nothing about their courting and mating. We moved by boat late in the afternoon, around 1 hour before sunset, the best time to spot mandarin fishes. We found them in shallow water, at a 5-6 meters depth, among broken corals. When the light began to blunt, they started to came out. First swimming around, approaching one to the other, then starting to court by joining, swimming up closely together, flapping quickly their fins in an incredibly wonderful love dance. Lots of divers tried to catch pictures, a hard task since most of the times as soon as the mandarin fishes get disturbed by the light they hide in the corals. I was happy not to be an underwater photographer, desperately trying to get some good shot. It was indeed so nice just to stay there, almost still, following and admiring their colours and their moves. I felt as in front of pure harmony, something that is hard to describe in words. 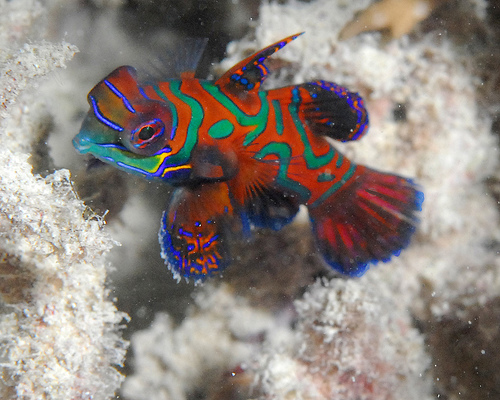 So I searched for a video because only the images in motion can render at least in part what the sight of the mandarin fish love dance looks like to the ones which never saw it. Have a look , it is really worth! Very very very nice post. The shots of fishes are simply charming. Wonderful. Your writing has a flavour of its own. Thank you Asim. True, the shots are beautiful. The divers who took them did a really good job. But was is great, is just admiring them.